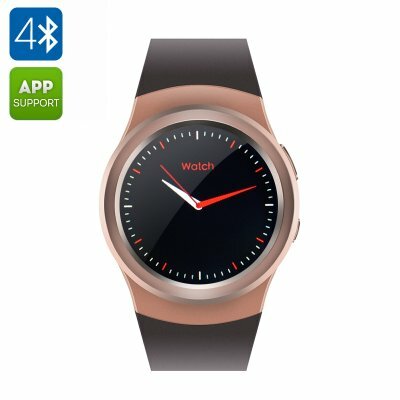 Successfully Added No.1 G3 Smart Watch - Heart Rate Monitor, MTK2502 CPU, Customizable Watch Faces, Android and iOS Apps (Gold) to your Shopping Cart. NO.1 G3 GSM smartwatch comes with an expansive circular display, is equipped with a heart rate monitor, UV sensor and more. Elegant, and yet perfect for the outdoors, the NO.1 G3 GSM watch is feature-packed and comes at inly a fraction of a price of other branded models. The NO.1 G3 comes with a nice full round display, which gives you a great view of the dial and lets you easily see notifications without squinting. With a stainless steel body and a soft flexible wrist strap, the watch is reliable and comfortable to wear on any occasion: whether a sports outing or a formal business dinner. The full round display is fully customizable and lets you switch between watch faces – a great feature to add a bit of variety to your wrist gadget. Add a different-colored wrist strap for full affect and turn your NO.1 G3 into a completely new style. Keep track of your fitness, rest and overall health with the watch’s fit trackers and health monitors. You will be able to watch your heart rate, get notifications when you’ve spent too much time behind the desk and monitor your activity with Pedometer. The watch will even sum things up for you with its Health Index feature. The NO.1 G3 comes with apps for Android and iOS and even works with Siri. You can also use it as a remote trigger for your Camera and remote control for your Music Player. The NO.1 G3 smartwatch works as a GSM phone letting you make calls right from your wrist. You can also sync your text messages and contact lists with your smartphone for further convenience. The GSM smartwatch comes with 128MB of internal memory and supports up to 16GB externally. The watch sports a 350mAh battery and a nice magnetic charger so that you can quickly and easily power it up when needed. The NO.1 G3 GSM Smart Watch comes with a 12 months warranty, brought to you by the leader in electronic devices as well as wholesale Android Phones.. The heart rate sensor monitor on this product isn’t for professional athletes, it is used for overall heart-rate guidance.